Vishal Bhardwaj’s Matru Ki Bijlee Ka Mandola is now available for streaming on Netflix. I love this quirky comedy from earlier this year. Here’s a link to Netflix’s current “Bollywood” catalog (they have a separate category for “Hindi-Language” films that’s mostly the same thing). A few movies in Eros Now’s “Coming Soon” section have confirmed dates for when they will become available on the streaming service. Those include: Welcome to Sajjanpur (November 8), Paan Singh Tomar (November 15), No One Killed Jessica (November 15), and Aamir (November 22). This entry was posted in Streaming Video and tagged Aamir, Bollywood, Eros Now, Hindi, Indian, Matru Ki Bijlee Ka Mandola, Movie, Netflix, No One Killed Jessica, Paan Singh Tomar, Streaming Video, Welcome to Sajjanpur on November 3, 2013 by Kathy. No new Hindi movies will open in the Chicago area this Friday, but you’ve still got a chance to see three recent releases. Dhobi Ghat (Mumbai Diaries) carries over at the AMC Loews Pipers Alley 4 in Chicago, AMC South Barrington 30 in South Barrington and Regal Cantera Stadium 30 in Warrenville. The Pipers Alley 4 also has No One Killed Jessica. And Dil Toh Baccha Hai Ji gets a second week at the South Barrington 30 and Big Cinemas Golf Glen 5 in Niles. Other Indian movies showing around Chicagoland include Four Friends (Malayalam), Jai Bholo Telangana (Telugu), Thoonga Nagaram (Tamil) and Yutham Sei (Tamil) at the Golf Glen 5. This entry was posted in Weekly Theater Updates and tagged 2011, AMC Loews Pipers Alley 4, AMC South Barrington 30, Big Cinemas Golf Glen 5, Bollywood, Chicago, Dhobi Ghat, Dil Toh Baccha Hai Ji, February 4, Four Friends, Friday, Hindi, Indian, Jai Bholo Telangana, Malayalam, Movie, Mumbai Diaries, Niles, No One Killed Jessica, Regal Cantera Stadium 30, South Barrington, Tamil, Telugu, Thoonga Nagaram, Warrenville, Yutham Sei on February 2, 2011 by Kathy. Dil Toh Baccha Hai Ji is the only new Hindi movie opening in the Chicago area the weekend beginning January 28, 2011. The romantic comedy stars Ajay Devgan, Emraan Hashmi and Omi Vaidya as three guys searching for love. Dil Toh Baccha Hai Ji opens on Friday at the Big Cinemas Golf Glen 5 in Niles and AMC South Barrington 30 in South Barrington. The movie has a listed runtime of 1 hr. 55 min., but I suspect it’s longer than that. After earning $365,287 in its first weekend in U.S. theaters, Dhobi Ghat (Mumbai Diaries) gets another week at the Golf Glen 5 and South Barrington 30, as well as AMC Loews Pipers Alley 4 in Chicago and Regal Cantera Stadium 30 in Warrenville. No One Killed Jessica, which has earned $428,691 in the U.S. so far, gets a fourth week at the Pipers Alley 4. Yamla Pagla Deewana leaves area theaters on Thursday with an impressive $851,381 two-week American haul. Other Indian movies showing around Chicagoland this weekend include Aadukalam (Tamil), Alaa Modalaindi (Telugu), Traffic (Malayalam) and Wanted (Telugu — not the Salman Khan movie by the same name) at the Golf Glen 5. This entry was posted in Weekly Theater Updates and tagged Aadukalam, Ajay Devgan, Ala Modalaindi, AMC Loews Pipers Alley 4, AMC South Barrington 30, Big Cinemas Golf Glen 5, Bollywood, Chicago, Dhobi Ghat, Dil Toh Baccha Hai Ji, Earnings, Emraan Hashmi, Friday, Hindi, Indian, Malayalam, Movie, Mumbai Diaries, Niles, No One Killed Jessica, Omi Vaidya, Regal Cantera Stadium 30, Runtime, South Barrington, Tamil, Telugu, Traffic, Trailer, Wanted, Warrenville, Yamla Pagla Deewana on January 26, 2011 by Kathy. Aamir Khan’s latest, Dhobi Ghat (Mumbai Diaries), is the only new Hindi movie opening in the Chicago area on Friday, January 21, 2011. Dhobi Ghat, which stars Khan as one of four characters whose stories intertwine across class lines, marks the directorial debut of Khan’s wife, Kiran Rao. This is no reflection on the quality of the movie, but I find Dhobi Ghat‘s trailer really annoying. The three-mini-trailers-in-one structure loops the same music throughout and provides three concrete end points, tricking you into believing the trailer is over before it actually is. It was clever the first time I saw it, but infuriating by the fifth. Dhobi Ghat opens on Friday at the AMC Loews Pipers Alley 4 in Chicago, Big Cinemas Golf Glen 5 in Niles, AMC South Barrington 30 in South Barrington and Regal Cantera Stadium 30 in Warrenville. The movie has a listed runtime of 1 hr. 40 min. Yamla Pagla Deewana, which earned $504,116 in its first weekend in U.S. theaters, gets a second week at the Golf Glen 5, South Barrington 30 and Cantera 30. No One Killed Jessica gets a third week at the Pipers Alley 4 and South Barrington 30, having earned $372,357 in the U.S. so far. Other Indian movies showing in the Chicago area this weekend include Aadukalam (Tamil), Anaganga O Dheerudu (Telugu), Kaavalan (Tamil) and Mirapakai (Telugu) at the Golf Glen 5. This entry was posted in Weekly Theater Updates and tagged 2011, Aadukalam, Aamir Khan, AMC Loews Pipers Alley 4, AMC South Barrington 30, Anaganga O Dheerudu, Big Cinemas Golf Glen 5, Bollywood, Chicago, Dhobi Ghat, Earnings, Friday, Hindi, Indian, January 21, Kaavalan, Kiran Rao, Mirapakia, Movie, Mumbai Diaries, Niles, No One Killed Jessica, Regal Cantera Stadium 30, Runtime, South Barrington, Tamil, Telugu, Trailer, Warrenville, Yamla Pagla Deewana on January 19, 2011 by Kathy. One new Hindi movie opens in the Chicago area on January 14, 2011. Yamla Pagla Deewana stars Bollywood legend Dharmendra and his sons, actors Sunny and Bobby Deol, as a family of con artists who must rescue a pretty girl. Yamla Pagla Deewana opens Friday at the AMC Loews Pipers Alley 4 in Chicago, Big Cinemas Golf Glen 5 in Niles, AMC South Barrington 30 in South Barrington and Regal Cantera Stadium 30 in Warrenville. The movie has a listed runtime of 2 hrs. 25 min. All four of the theaters carrying Yamla Pagla Deewana are also holding over No One Killed Jessica, which earned $227,473 during its first weekend in U.S. theaters. Tees Maar Khan leaves area theaters, having earned $1,072,686 in the U.S. so far. Other Indian movies showing around Chicagoland this weekend include Anaganga O Dheerudu (Telugu), Kaavalan (Tamil), Mirapakai (Telugu) and Prama Veera Chakra (Telugu) at the Golf Glen 5; Manmadhan Ambu (Tamil) at the Cantera 30; and Siruthai (Tamil) at Sathyam Cinemas in Downers Grove. This entry was posted in Weekly Theater Updates and tagged 2011, AMC Loews Pipers Alley 4, AMC South Barrington 30, Anaganga O Dheerudu, Big Cinemas Golf Glen 5, Bobby Deol, Bollywood, Chicago, Dharmendra, Downers Grove, Earnings, Friday, Hindi, Indian, January 14, Kaavalan, Manmadhan Ambu, Mirapakai, Movie, Niles, No One Killed Jessica, Prama Veera Chakra, Regal Cantera Stadium 30, Runtime, Sathyam Cinemas, Siruthai, South Barrington, Sunny Deol, Tamil, Tees Maar Khan, Telugu, Trailer, Warrenville, Yamla Pagla Deewana on January 12, 2011 by Kathy. When a movie begins with promise, it’s almost more disappointing when it falls apart than if it had been terrible from the beginning. Such is the case with No One Killed Jessica (NOKJ), which fizzles after a gripping first hour. NOKJ begins with a disclaimer that the movie is a mix of fact and fiction, and not a strict reenactment of the Jessica Lall murder case. Based on accounts of the case at Wikipedia, the only major changes the movie makes are to the names of the persons involved. From a dramatic standpoint, sticking so closely to the facts actually makes for a weaker movie. If you want to avoid plot spoilers, you may not want to read further (and certainly don’t go to the Wikipedia page). The movie begins with Jessica’s murder at a party attended by 300 Delhi socialites. Jessica, in her capacity as a celebrity bartender, refuses to serve a trio of young men after last call. One of the men, Manish (Mohammed Zeeshan Ayyubas), shoots Jessica in the head and flees the scene. Since the murder took place in front of several eyewitnesses — and that dozens more saw Manish run from the party — it seems like an open-and-shut case. Given the likelihood of conviction, popular war correspondent and reporter, Meera (Rani Mukerji), turns down the opportunity to cover the story. But victory looks less certain after Jessica’s bookish sister, Sabrina (Vidya Balan), talks to the prime witnesses. Those who are even willing to speak to her are either too scared to testify or willing to sell their testimony to the highest bidder. Rumors swirl that Manish’s wealthy politician father is threatening witnesses. Up to this point in the story, the movie is terrific. The scene in which Jessica is shot is tense, and Manish undergoes an impressive transformation from arrogant clubgoer to terrified suspect. There’s just enough of Meera, the foul-mouthed but charming reporter, to make us want to see more of her. Balan is riveting as Sabrina. Jessica’s introverted sister becomes her unlikely advocate, working with the one beleaguered police chief more interested in the truth than placating a killer’s politician father. Sabrina expresses her emotions in few words, sitting stone-faced, as a high society woman, who professes her fondness for Jessica, claims to have forgotten what happened that fateful night, all while blithely stuffing her face with chocolate cake. But the story loses its intensity as soon as the case goes to trial. The lawyers are poorly-written and poorly-acted. All of the key testimony is given over the course of a few days, but a montage accelerates time forward six years. While this is true to the actual case, it makes little sense in a fictionalized account. Plus, there’s no mention of what Meera was doing during that time. After the initial trial results in an acquittal, Meera makes getting justice for Jessica her personal mission, and uses her news program to do so. While crass Meera injects some much-appreciated humor into the film, the story stops being about Jessica at this point. It becomes a cheesy paean to the power of the people. While it is true that it took public outcry to prompt a retrial of Jessica’s killer, the movie puts too much focus on the people doing the protesting, overshadowing Jessica and Sabrina. There are “man on the street” interviews set to absurdly patriotic violin swells. It’s very on-the-nose, and it makes the movie longer than it needs to be. The point that an outraged populous can affect justice could’ve been made more subtly and more succinctly. *Even though No One Killed Jessica has no official MPAA rating, consider it an R-rated movie. Meera curses a blue streak in both Hindi and English. The scene in which Jessica is shot is so intense that a child at the showing I attended cried. This is not a movie for children. This entry was posted in Reviews and tagged 2.5 Stars, 2011, Bollywood, Hindi, Indian, Jessica Lall, Mohammed Zeeshan Ayyubas, Movie Review, No One Killed Jessica, NOKJ, Rani Mukerji, Vidya Balan on January 8, 2011 by Kathy. 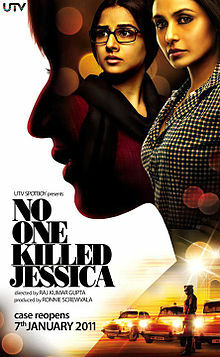 2011 kicks off in exciting fashion with the release of the legal thriller No One Killed Jessica. The film, based on the real-life murder of model Jessica Lal, stars Vidya Balan and Rani Mukerji as two women out for justice. No One Killed Jessica opens in the Chicago area on Friday, January 7, at the AMC Loews Pipers Alley 4 in Chicago, Big Cinemas Golf Glen 5 in Niles, AMC South Barrington 30 in South Barrington and Regal Cantera Stadium 30 in Warrenville. It has a listed runtime of 2 hrs. 10 min. The comedy Tees Maar Khan, having earned $1,030,502 in the U.S. so far, gets a third week at the Golf Glen 5, South Barrington 30 and Cantera 30. Other Indian movies showing around Chicago this weekend include Kandahar (Malayalam), Manmadhan Ambu (Tamil) and Ragada (Telugu) at the Golf Glen 5. Sathyam Cinemas in Downers Grove will also carrying Manmadhan Ambu and Ragada. This entry was posted in Weekly Theater Updates and tagged 2011, AMC Loews Pipers Alley 4, AMC South Barrington 30, Big Cinemas Golf Glen 5, Bollywood, Chicago, Downers Grove, Earnings, Friday, Hindi, Indian, January 7, Jessica Lal, Kandahar, Malayalam, Manmadhan Ambu, Movie, Niles, No One Killed Jessica, Ragada, Rani Mukerji, Regal Cantera Stadium 30, Runtime, Sathyam Cinemas, South Barrington, Tamil, Tees Maar Khan, Telugu, Trailer, Vidya Balan, Warrenville on January 5, 2011 by Kathy.